Information about the third annual Jewish and Israeli Blog awards is here. 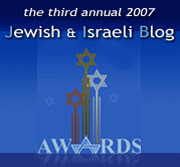 The "Jewish and Israel Blog Awards" are the J-blogosphere's informal annual award contest. The aim of the contest is to direct new readers towards Jewish, Israeli, and pro-Israel blogs. The JIBs begin with nominations, then a semifinal and final round. Good-natured rivalry and campaigning are associated with this event. Those who have already been nominated in at least some of the categories are listed here.